Austrian Chancellor Sebastian Kurz has arrived in Rwanda for an official visit where he is expected to discuss with President Kagame preparations of the African Forum scheduled in Vienna – December 18th. 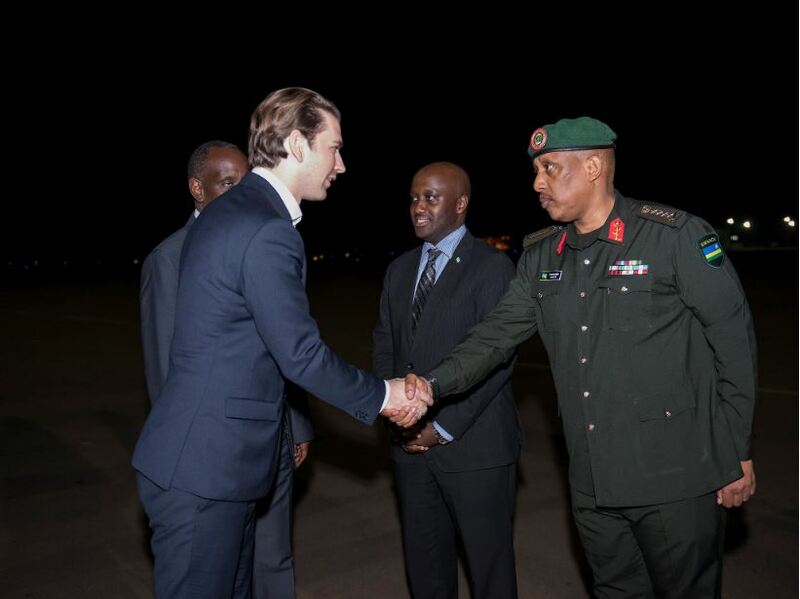 On Thursday evening, Kurz was received by Dr Richard Sezibera, Minister of Foreign Affairs and Cooperation and other high ranking officials upon arrival at Kigali International airport. He is also expected to hold a joint press conference with President Paul Kagame this morning. The visit of Kurz was announced by Ambassador Christian Fellner upon presenting his credentials to represent Austria in Rwanda on Wednesday. “Indeed we have activities coming up. Already, the head of my government is going to visit Kigali on Friday. His Excellency Paul Kagame and the Federal Chancellor Sebastian Kurz are going to discuss about an upcoming event in Vienna,” he said. Fellner said, the event will be attended by heads of state and government and representatives of both European Union and African Union. While Kagame is current chairperson of the African Union, Kurz is chairperson of the European Union. “So we have African Union – European Union forum in Vienna on December 18th,” the Ambassador said adding that both heads of States will co-chair the forum. The ambassador believes, Austria has something to learn from Africa and Rwanda in particular. “Rwanda is among those countries that have a dynamic IT sector for example, modern technics in agriculture will also be on agenda,”he said. Meanwhile, according to Fellner, the Chancellor’s visit includes a business delegation which will hold talks with Rwanda Development Board (RDB). The delegation is also expected to visit some private businesses. A communique from office of the president indicates that the visiting chancellor will visit Kigali Memorial Centre, followed by the 4G Network operation centre, the Cyber Security centre, Africa Olleh Services centre and K-Lab, all at Telecom House. “The Chancellor will end his tour with a visit to the Special Economic Zone where he will visit Africa Improved Foods and STRAWTEC Building Solutions industries,” reads part of the communique. Austrian parliamentarians are also expected to visit their Rwandan counterparts any time soon. Austria has a lot to offer as far as investment is concerned. Fellner said his country is well grounded in energy infrastructure. He also said, they have a cable car company. The Rwandan cable car project has been pending for several years.